Couples, in particular, sometimes face the question of where to locate their celebration: Where one or the other partner is from? Where the couple lives, or plans to live after marriage? Or at a “destination” city hundreds or thousands of miles away? Air travel causes tremendous greenhouse gas emissions per passenger, making location one of the most significant environmental choices for any wedding. How many guests will have to fly to attend? For an estimate of the climate impact of travel to various locations, enter the number of guests and where they’ll be coming from into TerraPass' Wedding Carbon Calculator, http://www.terrapass.com/wedding/. For some suggestions for minimizing the environmental impact of transportation to your celebration generally, see Transportation, Travel and Honeymoon. For many Jewish families, holding both the ceremony and a celebration afterwards at their synagogue or temple is a natural way to ensure that the event helps to support their Jewish community. Others can simply host the celebration at home or at the home of a friend or family member. You can also consider a non-profit organization where your rental fee will support good work. Your local Parks and Recreation Department will most likely have event spaces where the rental fees will support that park. Jewish Community Centers offer a wide range of social, cultural, recreational, and educational programs and services. There are 18 JCCs in California. You can find your nearest JCC at www.jcca.org/find_jcc.html. San Francisco’s spacious Contemporary Jewish Museum, www.thecjm.org (415.655.7827), educates the community about contemporary Jewish culture, history, art, and ideas. Contact rentals@thecjm.org. Events held at the Gardens at Heather Farm, http://www.gardenshf.org (925.957.1678), with a view of Mt. Diablo, support a living museum and wildlife habitat. Capacity: 150. Or try the gardens of the Allied Arts Guild, www.alliedartsguild.org (650.322.2405) in Menlo Park, which contribute to the guild’s financial support for critically ill children at the Lucile Packard Children’s Hospital. Capacity: 140. (415.512.5104) in San Francisco, support the formerly unemployable drug addicts, homeless people, and ex-felons that live and work there. The historic Lyford House, www.tiburonaudubon.org/ (415.388.2524) in Tiburon, overlooking the San Francisco Bay, supports the Richardson Bay Audubon Society and Wildlife Sanctuary. Capacity: 50 on the terrace, 150 on the meadow. Events at the SPUR Urban Center (LEED certification pending), www.spur.org/ (415.644.4296), support good planning and good government through research, education, and advocacy. For a natural setting, take a look at the many facilities run by the San Francisco Recreation and Parks Department, www.parks.sfgov.org (415.831.5500), which support park maintenance and recreational programs throughout the city. Capacity: 50-250, depending on location. www.ebparks.org/activities/corpfamily/br (888.EBPARKS), including the Brazilian Room and Fern Cottage, support the parks. And events held at one of the nine facilities in the San Francisco Presidio, www.presidio.gov (415.561.5444), support the preservation of the natural areas, wildlife habitats, and historic buildings of the park. Capacity: up to 735, depending on facility. If you would like to celebrate in a Jewish sanctuary space and aren’t already connected to a congregation that has one, the Jewish Federation of Greater Los Angeles, www.jewishla.org, provides a list of local Jewish congregations which may rent their facilities. The Skirball Center, www.skirball.org (310.440.4571), in Los Angeles explores the relationship between Jewish heritage and American democratic ideals, nestled on 15 acres in the Santa Monica Mountains. of parks and open spaces throughout the LA area that can host special events. (310.837.3610). They boast one of the most sustainably designed urban spaces in the country and are 100% solar powered. Capacity: up to 300. The Earl Burns Miller Japanese Garden, www.csulb.edu/~jgarden/index.html (562.985.8889), is run by and located at California State University Long Beach. You may be looking to hold your event at a hotel, or simply to reserve a block of rooms for out-of-town guests. If possible, choose a hotel where workers have a say in their wages, hours, and working conditions. Find union hotels in the San Francisco Bay Area and the Los Angeles area at www.hotelworkersrising.org/HotelGuide. When hotel owners reject hotel workers’ efforts to organize for a voice on the job, the resulting labor disputes can complicate your event — and hurt the workers’ efforts to make clear that customers support them. In the Jewish community, the Conservative, Reconstructionist, and Reform movements, and several national Jewish organizations, already work with the Informed Meetings Exchange (INMEX), a resource for conference planners, to ensure their conventions don’t patronize hotels involved in labor disputes. You can follow their lead by steering clear of hotels that UNITE-HERE, the union of hotel and restaurant workers, is asking travelers to boycott. Again, search by city, state, or metro area at: www.hotelworkersrising.org/HotelGuide. The Just Journeys Campaign asks the Jewish community to respect and support hotel workers when they travel by taking the Just Journeys Pledge. The pledge, which appears below, includes several specific yet simple steps that travelers can take to improve hotel employees’ working conditions and protect their health. Consider these guidelines in choosing a hotel for your out-of-town guests. You can also consider sharing these guidelines with your guests, perhaps as part of any hospitality bags you leave for them at the hotel. To view and sign the Pledge, click here. As a hotel guest, I appreciate the hard work that hotel workers put into ensuring that I feel at home while away from home. These workers engage daily in the mitzvah/commandment of hakhnasat orchim/hospitality to guests by cleaning rooms, making beds, and otherwise ensuring that I am as comfortable as possible. I recognize that hotel work is difficult work. The rate of injuries for hotel housekeepers is 10.4%, more than double the injury rate for service sector workers as a whole. Two-thirds of housekeepers report taking pain medication just to get through the day. 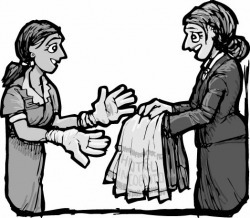 I also know that hotel housekeepers, most of whom are immigrant and minority women, often struggle to support their families through these jobs, which frequently pay as little as $8.50 an hour, and which often offer no health insurance. I will not stay in hotels that are in the midst of a labor dispute. I know that I can find updated information on current labor disputes at www.hotelworkersrising.org/HotelGuide. When possible, I will stay in a union hotel. I understand that union workers in the service industry earn, on average, 33% more than non-union workers, and that unions provide the most effective vehicle for workers to secure fair wages and health care, and to register complaints about misconduct. I know I can find a union hotel at www.hotelworkersrising.org/HotelGuide. I will tip the housekeepers who clean my room the suggested rate of $2-5 a day. I will take measures to save my housekeeper time and physical strain, including: keeping my room as clean as possible, throwing trash in the garbage can, piling towels in an accessible location, and stripping the bedsheets. If I am pleased with the housekeeping service, I will fill out the provided comment card, knowing that the worker who cleaned my room might receive a bonus or special commendation if guests appreciate her or his work. The Just Journeys Campaign is a project of The Progressive Jewish Alliance, Jewish Funds for Justice, and The Jewish Labor Committee.